This year Easter will be on April Fool’s Day, but it’s no joke how fast it came up again. So fast that I didn’t have time to color any eggs yet this year. I just finished my Easter decorations, even. 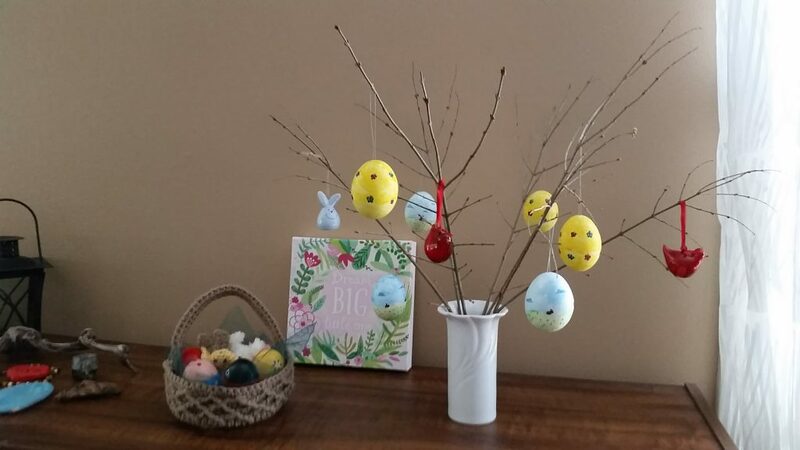 I usually have some branches with budding leaves in a vase and hang some emptied and painted Easter eggs. Then over a few days the leaves will come out because of the warmth of the room, and these tiny bright green leaves will look adorable. I am unsure if the leaves will come out by Sunday. We will see. 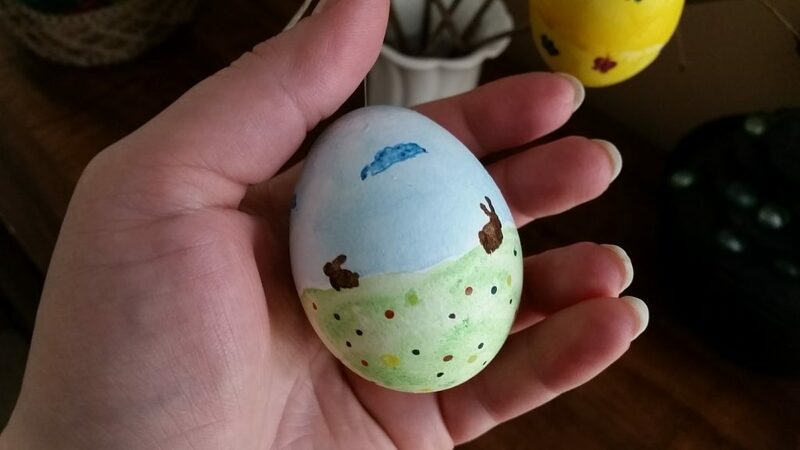 The eggs are painted with watercolor paint. I have hollowed them, so I can use them again each year. I even have 6 more blank eggs to paint, maybe next year. To hollow them you just need to take a raw egg, make a hole in each end and then blow really hard into the top hole. The raw egg white and yolk will come out the other hole. It takes a little afford to do. You will need to blow hard. Once empty, I wash them with water and dish soap, making sure to get some soapy water into the egg, swirling it around to get the inside clean, and then blowing out the water through the hole. Then I repeat just with water a couple times to get all the soap out. 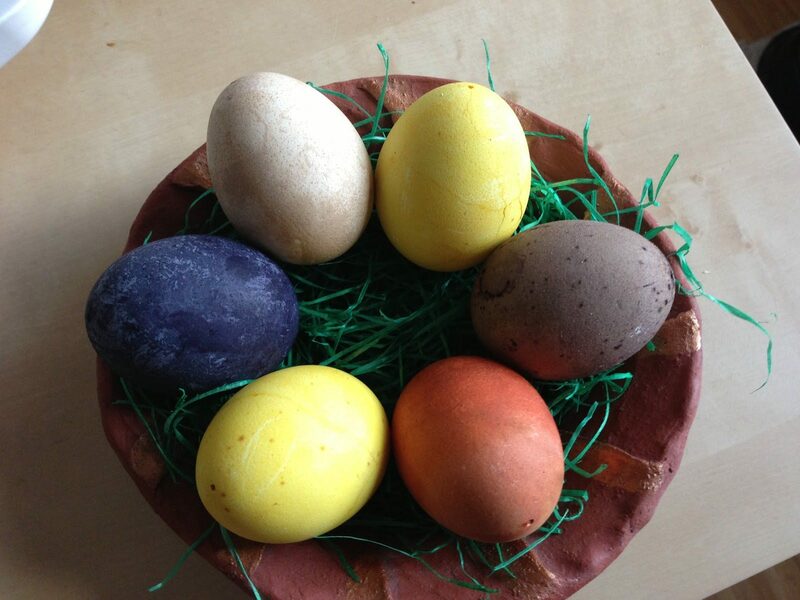 After having dried completely, the eggs are ready to be painted. 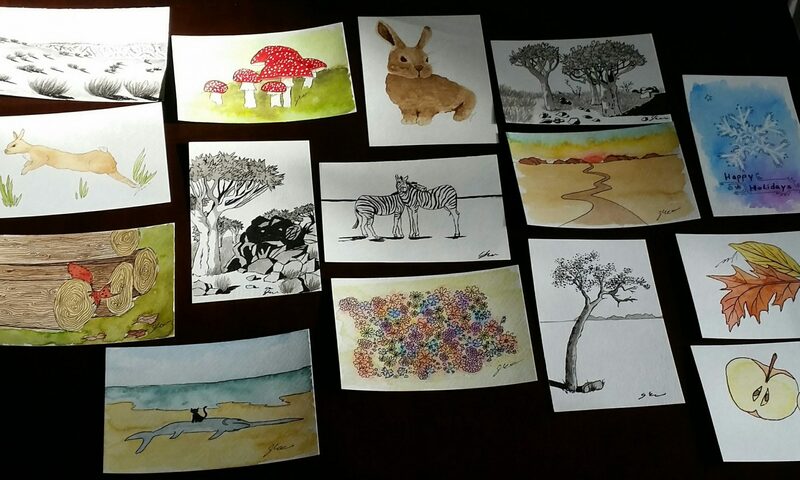 I chose a design with butterflies on a yellow background and a bunny in the meadow design for mine. Perfectly spring and Easter themed. To be able to hang them I used a tooth pick, tied some magic thread on it (clear jewelry thread) and made a loop. I inserted the toothpick into the top hole. It will turn sideways and not slide out of the hole again. 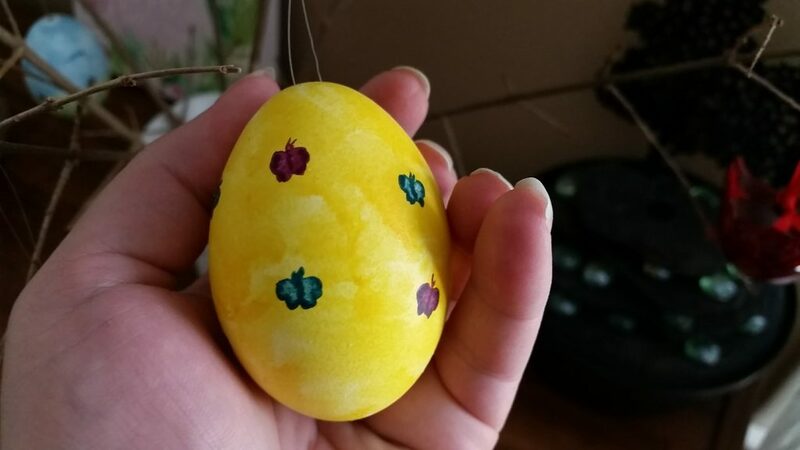 Voila, a cute Easter ornament. In addition, I usually decorate some hard boiled eggs just for that year. I have done just plain colors from the store, painted like a galaxy and some natural coloring with food items and spices. I love the ones colored with food items and had great success in the past. Below a little tutorial on that. I have used 5 different “colors”. Onion skin (brick red): 1 cup yellow onion skins per cup of water. Boil in a sauce pan for 30 min. Remove peels. Blueberry (dark blue): Mix 1 cup frozen blueberries with 1 cup water, bring to room temperature, and remove blueberries. Squeeze out the berries. Turmeric (yellow): Mix 2 tablespoons ground turmeric per cup of water. Paprika Powder (light red): Mix 2 tablespoons ground paprika per cup of water. I filled the coloring water into jars, added vinegar (1 tablespoon of vinegar per cup of color), and added white hard boiled eggs. From left to right: Onion skin, red wine, blueberry juice, 2 x turmeric and paprika powder. I let them sit in there overnight, stirring occasionally. I was really happy about the results. However, the onion skin and the paprika powder turned out surprising, I expected the opposite results. The red wine one turned out really interesting. There were tiny sparkling crystals all over it. I wonder what caused that. Here are some pictures of the result. Aren’t they fascinating? Clockwise from the top right we have turmeric (yellow), red wine (purple-ish), onion skin (brick red), another turmeric, blue berry (dark blue), and last and kind of least: paprika powder. 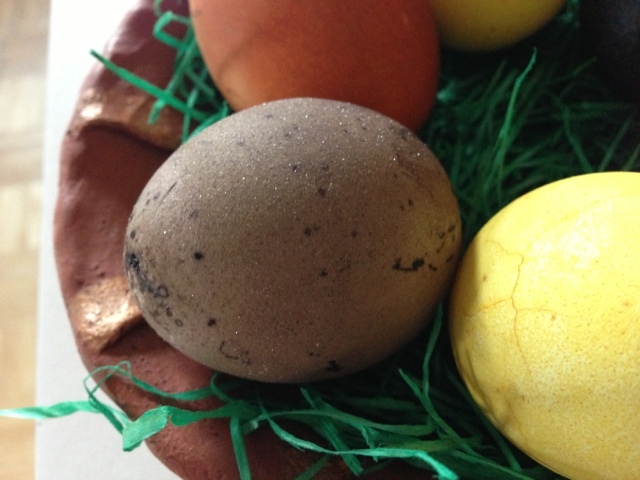 Egg colored with red wine has little sparkly crystals all over. What do you usually do for Easter decoration?